Five towns shifted allegiance and returned a Labour majority, local election results out yesterday showed. In Mellieħa, Pieta, Mqabba, Santa Venera and Mtarfa voters opted for Labour candidates with a majority of votes and seats. By the time of going to print, the outcome of Birkirkara, Mgarr and Msida was still unknown. The overall result gave Labour 56.7 per cent, the PN 42.3 per cent, and Alternattiva Demokratika 0.7 per cent. Previous elections in the same localities held over a span of four years – this is the first time that elections in these areas were held at one go – gave the PL 54 per cent of the vote against the PN’s 44 per cent. However, some candidates performed well, including incumbent Sliema mayor Anthony Chircop, who secured 2,231 first-count votes. 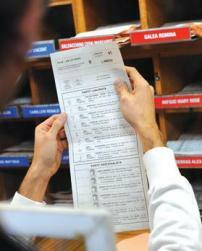 The counting process was delayed by 12 recounts requested by the PN. Elections in 33 localities were held on the same day as the general election. Turnout for the local election stood at 82 per cent with the highest being in Gudja and Mtarfa at 94 per cent and the lowest in Sliema, 57 per cent. EU nationals residing in Malta have a right to vote in local elections but most do not bother to do so, which may explain the lower turnout when compared with the 93 per cent for the general election. The Labour Party made gains across all 33 localities, consolidating its strength in areas where it enjoyed a majority and gaining substantial ground in others that were PN-leaning. Alternattiva Demokratika elected its only councillor, Michael Brigu­glio, in Sliema, having no success in Marsascala and Santa Venera. Mr Briguglio improved his tally by some 200 votes over last year’s election in Sliema that was held in the wake of a Government decision to dissolve a council hounded by serious problems. The highest scoring candidate was incumbent Fgura Labour mayor Byron Camilleri, who obtained more than 4,000 first count votes. In Valletta just 150 votes separated the two major parties with the PN retaining its majority. Incumbent mayor Alexiei Dingli got more than 1,000 votes and will retain the mayorship for the next term that will see Valletta getting ready for the European capital of culture celebrations in 2018. There was never any doubt that Tarxien would return a Labour majority but voters here had a different sort of battle to contend with. They had to choose between Christ and the Devil, in an epic race for the mayorship on the Labour side. Newcomer Joseph Abela, a popular figure in the area who works incessantly with parish groups and traditionally dresses up as Christ in Good Friday pageants, garnered 2,687 first count votes. He will be Tarxien’s next Labour mayor, beating incumbent Paul Farrugia, who goes by the nickname Ix-Xitan (the Devil). Mr Farrugia managed second place with 1,100 first count votes. The result means that Tarxien will have Christ as its mayor and the devil second in command, a situation that can see residents hope for help from above and below.